The great festival of Thanksgiving Day is on Thursday this week, for expressing our thanks to all customers, we released the updated version of PDF to Flash Catalog Professional 1.8.4 with new added amazing functions which can help people to make more fantastic digital product catalog or magazine, book. 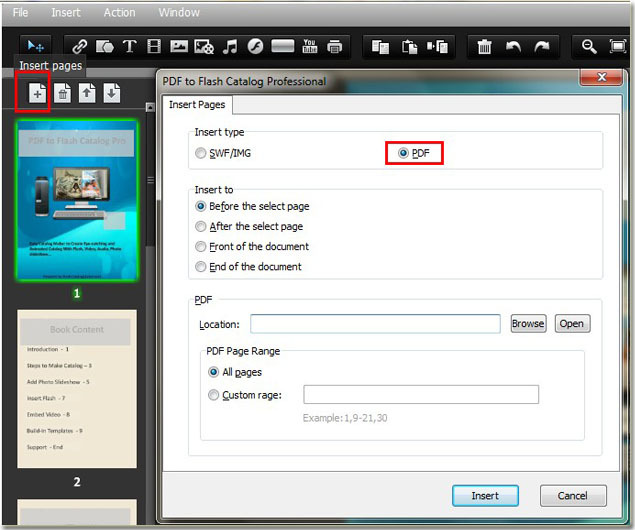 PDF to Flash Catalog Professional is an easy catalog software for everyone to convert PDF to page flipping flash catalog, magazine, book, brochure without any programming skills. Simply to say, it’s an easy digital product catalog creator, as many companies have chosen it to create digital catalog and company brochure till now. The new updated version of catalog software has kept the fantastic former features, such as apply scenes to make digital catalog with dynamic background, edit product catalog with animated text etc. 2. Pure and Intuitive Online Templates are added in Online Templates window. The amazing feature of catalog software is its online templates which would update from time to time so that people can create digital catalog or magazine with different styles with one catalog software. 4. Add embedded slideshow to product catalog. The old version of catalog software would allow people to add animated photo slideshow to product catalog or book, and the newest version can enable people to add animated slideshow which can totally make e-catalog more animated and eye-cached. 5. Provide flash resources for people’s convenience. People can easily add flash to product catalog, book by the former catalog software, and now people can also directly choose flash to decorate digital catalog or page flipping flash book. 6. Insert PDF or pages of PDF. The newest version of catalog software can not only allow people to insert image pages to digital product catalog, but also insert PDF or pages of PDF to product catalog for continuing designing. All in all, everyone can free download the newest version of catalog software for a try and every registered user can install the updated catalog software without paying anything.